Its Saturday - and that means another movie! 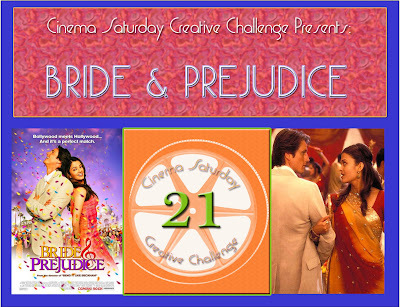 This week we decided to spice it up a bit and do a bollywood movie called: Bride and Prejudice, which is based on Jane Austen's book: Pride and Prejudice. Bollywood is a word that is popularly used to describe Indian cinematic movies - it is one of the largest film producing industries in the world! With Bollywood - I have found that people either love them or really don't like them. I love everything about them, I love the colors, the music, the actors... and yes, it is definitely overdramatic in some bits, but I still love it :) This movie was no different... I like how they wove the Jane Austen novel into the story of a family from Punjab India and the role of destiny bringing two souls countries apart together - and of course I love love the garba songs, bhangra songs that they threw in there too.. I wrote the sentiment using a Sanksrit style by writing it out with pencil and then writing over it with a Martha pen. I placed the card over my wedding sari that wore almost 8 years ago :) I loved this sari the first time I saw it and pulling it out this morning - I totally fell in love with it again :) I thought I would take a picture of the card on a wedding sari since it is a wedding card for my friend. I love all things sparkly and glittery and love getting all dressed up with my bangles, and necklaces. 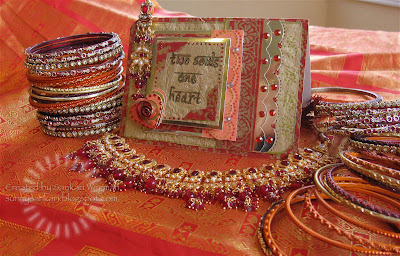 Luckily, there are so many celebrations in the Indian calendar that there is always an opportunity to get dressed up! Hope you have a chance to play along this week! You can check out more details at Cinema Saturday Creative Challenge! Wishing you all lots of happiness, song, merriment and spontaneous bursts of dance!!! Paper: Gold Paper: Paper company, red paper is handmade paper used for giftwrap. Its been quite a little vacation for us - but a much needed one! 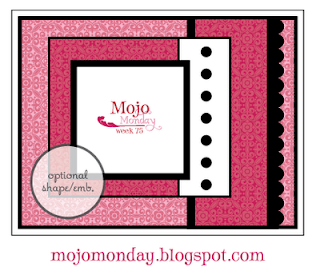 I can't believe its been almost two weeks since I blogged - wow! It was definitely nice to take a break and chillax with my family but I have missed all of you in blogland and can't wait to catch up with everyone! This is one of the five amazing movies that are up for nomination for Best Picture this year. This movie is inspired from F.Scott Fitzgerald's 1921 inspired short story by the same name. According to Wikipedia, this movie: "has received 13 Academy Award nominations, including Best Picture, Best Director, Best Actor and Best Supporting Actress." Life isn't measure in minutes, but in moments. I had been resisting seeing this movie - I don't know why exactly. I went to see it with one of my dear friends and was somehow not expecting anything huge (I thought it would be a good movie, but nothing spectacular). Well, by the end of the movie - I was just sobbing.... I don't even know why - but I was just in love with the movie... there is something so simple and beautiful about it and I thought Cate Blanchett and Brad Pitt (whom, I normally don't really like) were amazing - they both did such an amazing job! I couldn't believe how affected I was by the movie - I can't wait to see it again! Without giving anything away about the movie - I loved loved loved the theme of a love story moving through time. One of my favorite scenes is when he says to her something like: I want to remember us in this moment as we are right now as they both were looking in the mirror - I totally loved that scene and so that was my inspiration for this card. I wanted to capture a moment in time - I found pictures of my husband and myself when we were both young and enclosed that in a locket. This is a special card for my husband, who came home last night after a 2 week business trip. 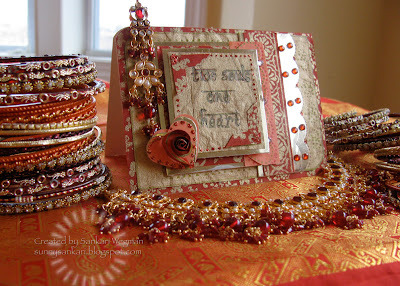 I had a lot of fun making this card and also going vintage which is the theme of this week's Cinema Saturday Challenge. This movie really made me think about time, family, love and how we live each moment of life. I just absolutely left inspired and grateful. 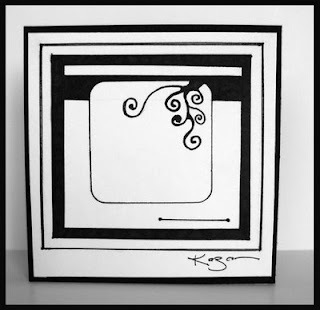 and this little card was a little love note for his return. The inside of the card reads: Time stands still with you. It is just amazing to me that we have know each other 10 years now, married for 8 this May because it feels like we have known each other forever, for lifetimes... time is such a strange concept sometimes... sometimes 10 years feels like a long time and sometimes it feels like the blink of an eye! My husband totally loved opening up his card last night - and that was the best part of making this card - was to see his expression. That was priceless and is forever captured in time in my memory:) What are your Oscar plans this weekend? Ours is to snuggle on the couch and watch with our family - there are really some amazing movies up for nomination this year! You can check out more details on the Cinema Saturday Creative Challenge blog. Paper: Paper Company (gold and green), Bazzil Basics: Bitter Chocolate, Kelly Panacci collection and Sandylion embellishments. Hi Everyone, I am sad to say that I didn't make a card for this week's challenge :(which is making me so sad - because I have a zillion ideas for a card after watching this movie again). This week I am on a mini-vacation as I visit my parents - I have to say, that while I was watching this movie with my parents (for pictures of grass for the sneak peek (LOL!) my mother totally fell in love with this movie (which is surprising because she is so not a martial arts kind of movie girl) but she just loved watching the artistry in these scenes. At one point she turned to me and said - "I feel like I have had my exercise for my lifetime just watching this!" I just started laughing - it was so cute! At the time that this will be posted, I will be on my way to a mini family reunion of sorts :)But I can't wait to come back and see all of your beautiful creations. It was awesome to read all of your guesses (Amy - you totally got it!) and can't wait till next week for our little Valentine's Cinema Saturday!! Hugs to all!!!! 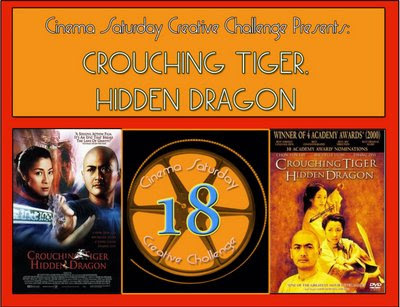 Check out the Cinema Saturday Creative Challenge for more details! Can't wait to see everyone's creations soon!